Looking at prices of Marine chain counters I am thinking of a DIY project. Might be a dumb question, but what’s wrong with painting the chain? 2. time your windlass. Electric motors used on commercial anchor windlasses are amazingly stable in both directions as long as the DC supply is within spec. And the manufacturer's specs, as shown in a users manual, will give the design handling rate. For example, the anchor windlass on the bow of Led Myne handles chain at 56 feet/minute or 17 metres/minute. Tain't no hardship to count seconds. Might even be to your advantage. 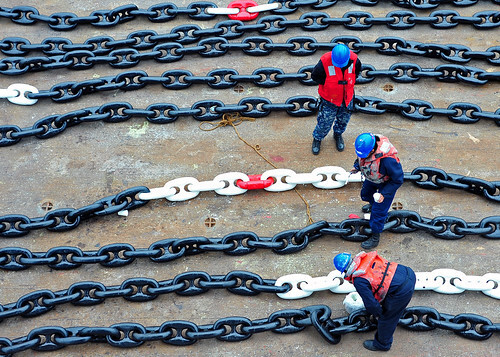 The US Navy paints chain. Good enough. Why would I add a gimmick just to break? More weight? More clutter? Not for free. I've heard of wireless bicycle computers being used as chain counters, that one of my future projects. Tired of marking the chain that can't easily be seen from the cockpit anyway. Sorry that people, myself included, are pooping your question. You didn't ask about paint. Anyways don't be bothered with any nay sayers who talk about what would be cheaper. Cheaper would be to not have a boat at all. To your request, of course you could DIY a chain counter. I have not but would first check if the sensor itself can handle the marine environment. You should check with the manufacturer. There are several versions of those magnetic sensors and there are some that are marine grade. As for the other components, I would think they would be fine so long as you keep them dry and inside the vessel. Good luck and happy hunting. Send some pics if you start putting something together. Nothing, but if your single handling on a bigger boat and your operating the windlass from the helm a chain counter is very helpful. I don't have one only because I struggle to get my head around the price. In fact that is the very project I have started. I got that counter earlier this week. It turns out that the chain wheel on my windlass move 14" of 5/16" HT chain per rotation. So by placing 4 magnets on the wheel each count will measure 3.5" of chain. So for every 10 counts I will measure 35" of chain. That is 1" short of a yard for every decade registered on the counter. This difference amounts to 3 yards out of 100 yards of chain. Thus, the right most digit on the counter represents tenths of a yard. As the counter has both a count up input and a count down input -- the only trick is to route the sensor pulses to the correct input. This can be done very simply with a SPDT relay. The sensor pulses connect to the common pole of the relay, the count up input of the counter is connected to the NC contact of the relay, and the count down is connected to the NO contact of the relay. The relay coil is connected to the UP switch of the windlass. In operation, when the chain is deployed by the windlass or allowed to free fall the counter will count up. And, when power is applied to the windlass to retrieve the chain the counter will count down. Fortunately, yards and meters are close enough that I can interchange them for anchoring purposes. Unfortunately, the math that allows this windlass/chain wheel configuration to work for me is unlikely to work for most other configurations. However, I hope that this example will give others a clue as to how-to adapt this counter method to their own needs. Arduino and Hall effect sensor. Though esp 32 might be a better bet these days, create a web page for the data. anchor chain counter to NMEA0183 Garmin proprietary sentences via arduino? Many power boats drop the anchor from the helm so chain marks cannot be seen. This is also sometimes done on a yacht, especially when single handing or when Med mooring. Paint is difficult to see at night without a light that effects night vision, and if you want to re-galvanise your chain the galvanisers don't like paint. The paint does not last long if you are frequently anchoring in a hard substrate. Plastic chain markers and/or cable ties/Spectra line solve some of the problems. The plastic chain markers are durable and cable ties or loops of Spectra can be felt even if they cannot be seen, but a digital chain counter is I think a nice solution, especially if one can be built at low cost. So keep us posted on details of the project. The difficulty is achieving reasonable reliability. The bow of boat is a very wet place and not a good environment for sensitive electronics. A wireless display would be an advantage. A mobile phone can be useful to take to the bow when anchoring. When coming into an anchorage it means the person at the bow can still monitor maps, depth, wind and even radar/AIS if desired. If an old phone is used, if it is damaged or dropped overboard it a not a great loss. Integrating a chain counter into this would work well and would save the cost and trouble of making a suitable display. For the display the same applies... some corrosion / waterproofing will need to be done as it would be mounted somewhere close to the helm or on the engine panel. The price of the thing is cheap enough to give it a shot... if it does not work, or breaks after a short while it does not break the bank and I will continue to eyeball the chain length while backing up. Any suggestions for waterproofing the sender and display? The receiver can be potted in epoxy, as you state - just ensure that the window only has a thin covering. As for the display, try and borrow a can of conformal coating (the price of one can would be too much for a single project). Use this prior to potting the display electronics in epoxy. The conformal coating permits the components some play (thermal expansion etc) within the shell of the epoxy/potting material. If you pot up to and including the edge of the segmented display, you should manage to keep all moisture out of the unit. Thanks for your input... being in Shenzhen .... the city of electronics, it should be easy enough to get all the components I need for the project. I remember reading somewhere of a guy developing an iPhone app that by analysing the sound of the chain going in or out gave you the actual meters like a chain counter. Seems smart! No moving parts at the bow. Don’t know if he ever made it work though.